J-6. 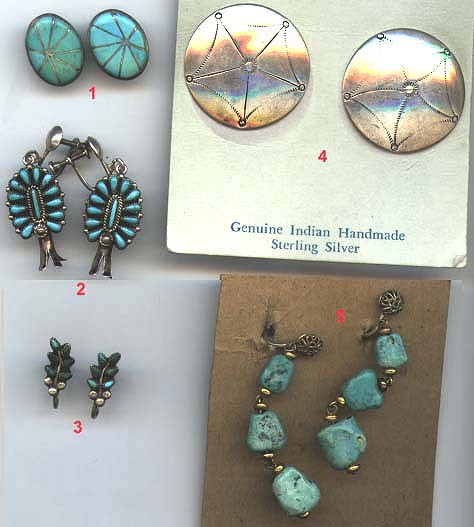 Vintage fleur-de-lis sandcast naja with old-style hands design to which has been soldered a natural turquoise set in silver braid, which may have once been an old ring. Naja is 2.5 in. wide; stone is 1-1/8 in. long x 5/8 in. wide. 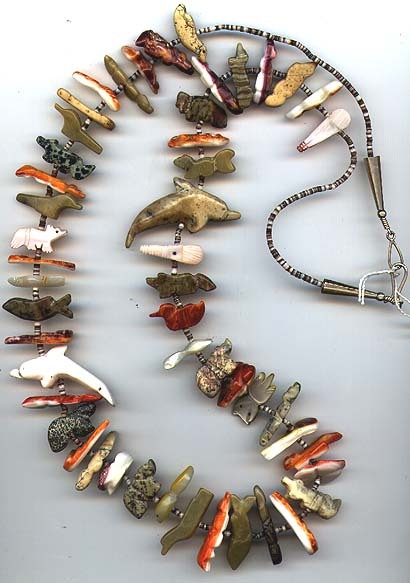 Naja is removable--hung on nicely wire strung handmade "pinyon" and machine-made sterling beads, almost 27 in. long. 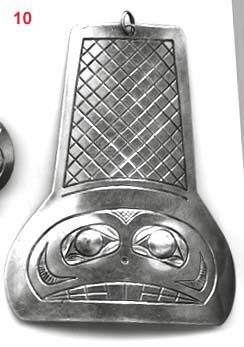 This is a dramatic and very interesting older piece, and comfortable to wear. SOLD. 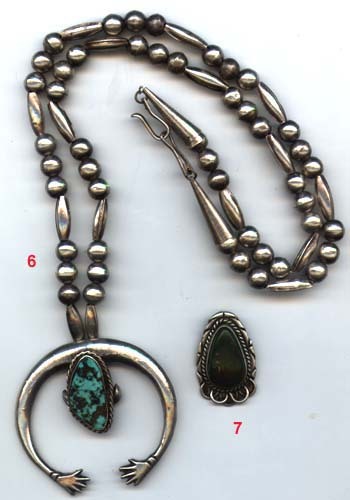 Next to it is J-7, a vintage natural turquoise pendent with deep green-brown turquoise, 1-5/8 in. long, with braided silver and nice stamp and wirework set in deep silver bezel. Signed "W S" and stamped with a four-cornered sun symbol. $52. J-13. 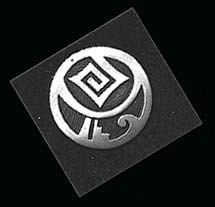 Old Hopi overlay pendant with finely incised background and fine pure blue turquoise stone, bird in flight motif, unsigned, 1.25 in. long, including loop, 1/2 in. wide. $55. J-12. 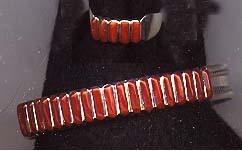 Elegant and sophisticated Zuni matching coral and sterling silver ring and bracelet by Lucy Shekya. Bracelet has nice braid on the side bands, and a 1-1/8 in. opening, and is slightly flexible for adjustment. The coral is an especially rich and deep red, $68 for the set. J-9. 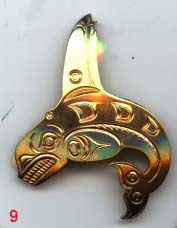 Dated 1976: Signed in script "G. Cross / 76" this sheet gold orca pendant is characteristically unmarked but tested as 14K and is 2-1/8 in. from dorsal fin to end of tail. SOLD. or email to: carol@migrations.com to place an order, request photos, or for more information. Copyright © 1996-2004 Carol Snyder Halberstadt, Migrations. All rights reserved.